House contents clearance West Lothian: Broxburn Uphall Dechmont Torphichen Armadale Deans Livingston Blackridge Whitburn. 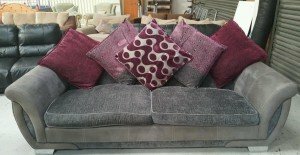 A large two seater low back sofa on chrome feet, upholstered in grey velour and suede, together with purple backing cushions. A Parker Knoll two seater high back vintage sofa and matching armchair, upholstered in damask fabric. 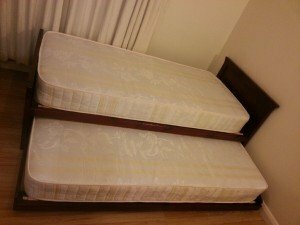 A sing solid wood bed with a black faux leather single headboard, having a slide out bed with two single mattresses. 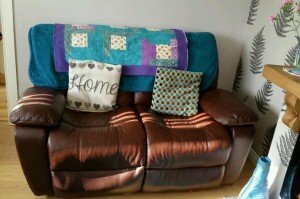 A two seater high back reclining sofa, upholstered in authentic chocolate leather, together with two cushions and two throws. 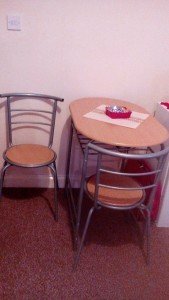 A small oval solid wood and chrome breakfast bar, together with two matching rounded back dining chairs. 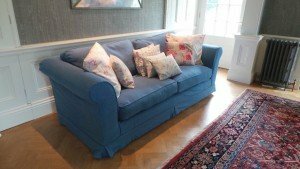 A small two seater low back sofa, upholstered in blue cotton fabric, together with a large amount of throw cushions and a large area rug. 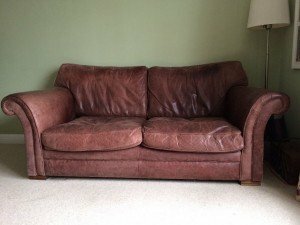 A small two seater high back sofa on solid wood square feet, upholstered in brown authentic leather. 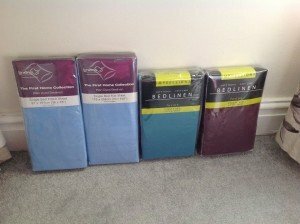 A collection of brand new bedding, to include two blue singled fitted bed sheets, a teal fitted single bed sheet and a maroon singe bed sheet. 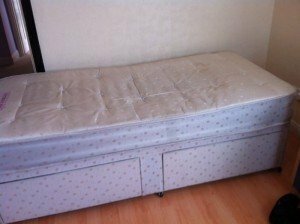 A single divan bed with two pull out storage drawers on black castors, together with a matching single mattress. 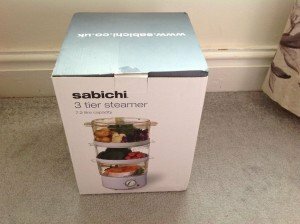 A brand new boxed Sabichi three tier 7.2 litre capacity white and clear steamer. 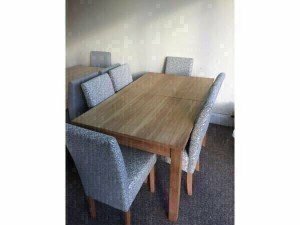 A solid wood extendible rectangular dining table, together with six high back grey dining chairs. 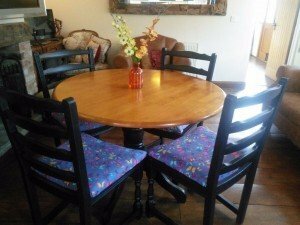 A large vintage solid wood circular dining table, together with four matching black dining chairs upholstered in butterfly patterned fabric. 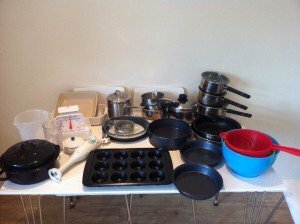 A large collection of kitchen accessories, to include saucepans, cake trays, a handheld blender, scales etc. 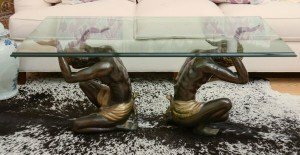 An art deco rectangular glass topped coffee table, with two bronzer kneeling lady statues as the base. 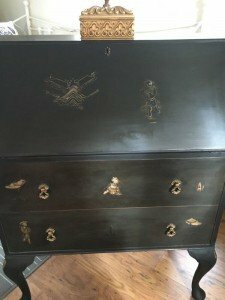 A black lacquered Oriental style vintage writing desk, having a lift up top to reveal the desk, above two drawers. 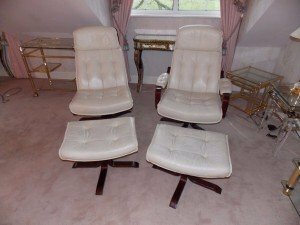 A pair of vintage mahogany swivel chairs and matching footstools, upholstered in white leather with button detailing. 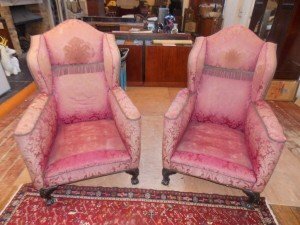 A pair of vintage high back armchairs on mahogany lion paw feet, upholstered in patterned pink fabric. 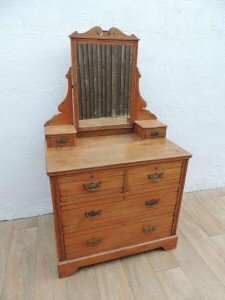 A solid oak vintage vanity unit, having a removable swing mirror above four drawers. 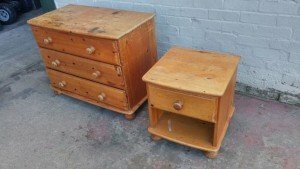 A solid wood chest of three drawers on ball feet, together with a small matching one drawer bedside table. 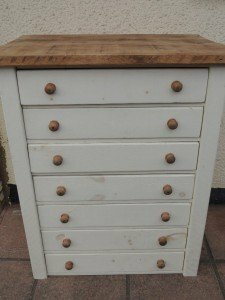 A large chest of solid wood drawers in the farmhouse style, having seven drawers, hand painted in white.